Exclusive fly-by from the Tiger Squadron at Redondo Beach Police Foundation’s Wine & Dine event. Over one hundred guests enjoyed fine wine by Patine Cellars, delicious cuisine by Baran’s 2239 and more! Proceeds to benefit the police foundation, moving forward its initiatives to advance public safety through innovation and technology. Join Redondo Beach Police Foundation on Friday, November 2 from 5:30pm – 9:00 pm at Casa Morris for our Fundraising Wine & Dine With A View. LA Kings tickets and more! Make sure to be there at 6:00 pm sharp to see our exclusive airshow, donated and flown by the Tiger Squadron Formation Flying Team! Tickets are sold out! Thank you for your support. Hundreds of families came out to King Harbors 2nd Annual Skateboarding Competition. Thank you to RBPD and those who supported this terrific community event for skateboarders of all ages! Taste of the South Bay's 10th anniversary event was a remarkable success this year! Hundreds of guests came out to Shade Hotel Redondo Beach to enjoy food from more than a dozen local restaurants, and to learn more about emergency trauma kits for our schools! The event was attended by Redondo Beach Police Chief Keith Kauffman, Capt. Joe Hoffman and our own board member Kelly Cheeseman (COO of LA Kings) and Phil Keenan. Also on hand were Kings President Luc Robitaille, current Kings players and superintendents of South Bay schools. The 10th Annual Taste of the South Bay is set for Thursday, August 23rd at Shade Hotel from 6pm-9pm. The upscale, food-centric social event returns to Shade Hotel's beautiful Redondo Beach location! Restaurants confirmed to provide samplings include: Abigaile Restaurant & Brewery, Baran's 2239, Bettolino Kitchen, BRIO Coastal Bar & Kitchen, Hey 19 Public House, Madre, Ortega 120, Rock N Brews, The Strand House, Sausal, Smoky Hollow Baking Co., Sea Level Restaurant + Lounge, Superba Food + Bread, and more! Proceeds from the event will be used to equip classrooms in the South Bay with emergency safety kits, a program started by the Redondo Beach Police Foundation in partnership with the Kings and RBPD. Taste of the South Bay is sponsored by The Domo Group, the Official South Bay Realtors of the LA Kings. On Wednesday, June 13th, RBPF’s Executive Director Taulene Kagan joined Chief Kauffman and close to one hundred RBPD officers, K9’s, detectives, staff and their families to celebrate the department’s annual oath of office and awards ceremony. Several officers, staff and K9’s were recognized for their heroism and excellence in policing and serving the South Bay communities, including several officers and a civilian who assisted and helped to save lives at the mass shooting and tragedy in Las Vegas. Ms. Kagan awarded the foundation’s first annual Visionary Award to Dinah Lary, Redondo Beach Police Department’s Community Services Manager. The award is given to a member of the department who exhibits excellence and aligns with the mission and vision of the foundation to strengthen community relations and advance public safety through innovation, and leadership. This past weekend, the Redondo Beach Police Department, in partnership with the RB Police Foundation, had its first ever surfing competition. KTLA Live caught the action with over 100 surfers of all ages, including police officers, Wounded Heroes of America veterans, Special Olympic athletes, and families for a day of sun, surf and fun. First Place team winners: Keith and Derek Brewer, Parker Browning, Ben Oien, Karsten Wanke, Jett Rocket Prefontaine with assistance in the first round by Drake Baxter and Wendy Menjivar. Join RBPF at Redondo Beach Police Department's "The Line Up Surf Contest"
Enter the contest, no matter your skill level or experience. If you don't surf, come join the festivities and watch some of the South Bay's best surfers in action and see which team will win the GOLDEN DONUT. Free contest, free lunch, free t-shirt, and lots of prizes! Register today! Visit www.redondo.org/surfcontest for more information. The Redondo Beach Police Foundation is proud to be a community partner to our local police department. Check out the innovative projects the Foundation has supported thus far. Please join us in our efforts to continue to do great things to improve public safety for the Redondo Beach community. The Redondo Beach Police Foundation, in partnership with the LA Kings and Redondo Beach Unified School District, will be rolling out its Trauma Kit Emergency Training and Kits this year to all schools in RBUSD. Thank you to the staff and Principal at Birney Elementary that hosted our first official training session. Big thank you to the Redondo Beach Police Department for inviting RBPF and guests to experience how their police officers train during our RBPF Training Day event! Participants had a great time getting to know the officers during their one-on-one training sessions. Guests had a chance to experience intense video simulated scenarios with laser guns in a firearms training exercise that tests judgement and response time to highly unpredictable and intense situations. The COO of the LA Kings (also, our Foundation board member) Kelly Cheeseman, participated in a role playing exercise and got bit by a K-9 police dog. Guests also experienced what it's like to respond to a call as part of the SWAT team, right alongside Redondo Beach Police SWAT officers. Thank you to LA Kings President, Luc Robitaille, for training with us! This was a one of a kind experience... Don't miss the next one! 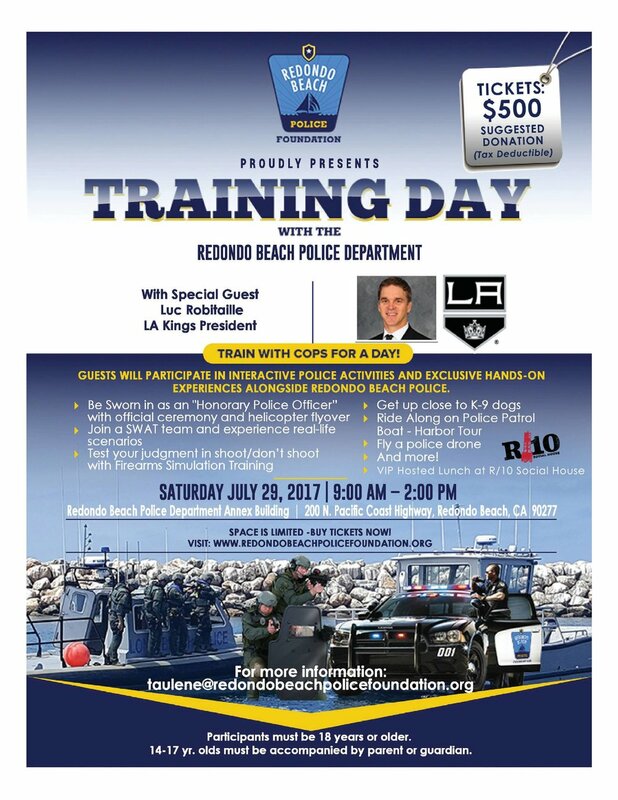 Redondo Beach Police Foundation Proudly Presents "Training Day with the Redondo Beach Police Department" With Special Guest, Luc Robitaille, President, LA Kings. Join us for an exclusive opportunity to train with cops for a day. Saturday, July 29, 2017, 9:00am – 2:00pm at the RBPD Annex Building, 200 N. Pacific Coast Highway, Redondo Beach, 90277. Don’t miss the chance to participate in police activities not available to the public. Must be 18 years or older to participate. Children 14 – 17 years old must be accompanied by a parent or guardian. For more information and for sponsorship opportunities contact Taulene Kagan at taulene@redondobeachpolicefoundation.org. Tickets are a suggest $500 donation. Space is limited so RSVP today! No walk-ins accepted. Thank you LA Kings and LA Kings Care Foundation for their tremendous support during the Kings vs. Jets game at the Staples Center. Not only was it a fantastic game where the Kings won(! ), but we were extremely proud to receive a check for $20,000, from funds raised at the Taste of the South Bay. These funds will place advanced emergency safety kits in our schools, to further protect our children. Taste of South Bay a huge success! Celebrating St. Patrick's Day with great food, a great crowd, for a great cause. 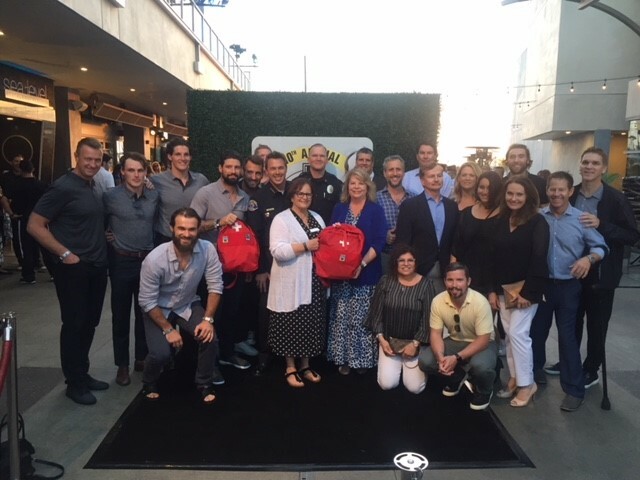 Thanks to the support of the LA Kings and their event, the Taste of the South Bay, Redondo Beach Police Foundation was able to place advanced emergency safety kits in every classroom in every school in the city to help protect our kids. Join the Redondo Beach Police Foundation on Thursday, March 23 for the LA Kings vs. Jets Game. The LA Kings is offering special discounted tickets to help raise funds for the Redondo Beach Police Department. The LA Kings will donate $5 for every ticket purchased through this link: www.lakings.com/redondoPD. Also, the Kings Care Foundation will auction Police uniform style jerseys on the mobile auction, viewable at www.lakings.com/auctions. THANK YOU LA KINGS FOR SUPPORTING THE REDONDO BEACH POLICE FOUNDATION! Come and support Redondo Beach Police Foundation during this upscale, food-centric social event at Shade Hotel's beautiful new location in Redondo Beach! In between tastings, guests can mix and mingle with LA Kings personnel and celebrities, play casino games, bid on the silent auction and more. Taste of the South Bay is sponsored by the Freedman Geilman Group, the Official South Bay Realtors of the Los Angeles Kings. Proceeds from the event will benefit Redondo Beach Police Foundation with funds earmarked to purchase classroom emergency safety kits for all Redondo Beach Schools. For tickets, visit: www.LAKings.com/taste. Redondo Beach Police Foundation announces its launch at Community Public Safety Fair. The thirteenth annual Redondo Beach Community Safety Fair and Police Department Open House was held on Sunday, October 2. The Safety Fair is the “kick-off” event for Fire Prevention Week and designating October as Crime Prevention Month. The turnout was fantastic and we have the pictures to prove it! We were happy to be able to take this opportunity to launch The Redondo Beach Police Foundation. LA Kings in Our Community! A recent council meeting saw a visit from Bailey, the mascot of the LA Kings. And he came bearing gifts–special personalized jerseys commemorating the King's 50th anniversary for Mayor Steve Aspel, City Attorney Mike Webb and Police Chief Keith Kauffman! The city of Redondo Beach and the Redondo Beach Police Foundation are grateful for the support from the Champs!